Moscow, the secretive centre of Eastern Europe. Since I was a child I was always fascinating with the idea of visiting this amazing place, of stepping behind the iron curtain and finally seeing places such as Red Square in all it’s glory. 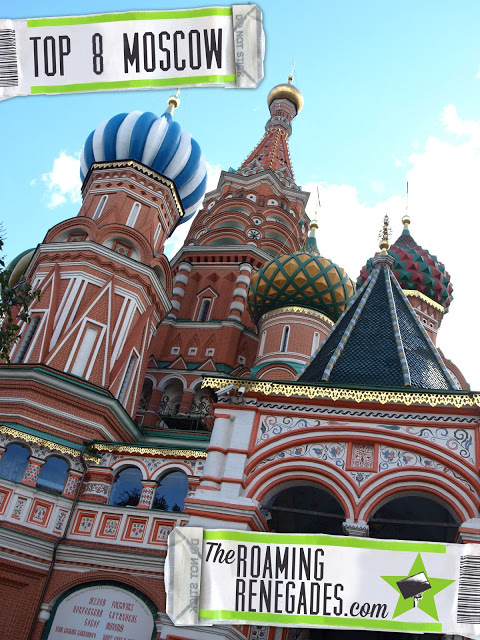 Moscow was a step into the unknown, a culture shock and a place unlike anywhere we had every visited. It thrilled us, surprised us and lived up to it’s reputation too. Here’s our top 10 things to see in the beautiful and diverse Russian capital. If there is one place so full of mystery and mystique in Moscow it is the Kremlin. The heart of the Soviet empire and the home of the Tsar the history here is diverse and incredible. To walk inside those walls is to step inside the Russian centre of power, where those secretive and provocative decisions are made but also home to many artefacts and breath taking churches. From the largest bell in the world to the unbelievable interior and stunning exterior of The Cathedral of the Assumption visiting the Kremlin will thrill and surprise you. The Kremlin and it’s trade mark red walls which line Red Square were once the ancient city walls of Moscow. The city’s modern day layout is still spirals out from this central spot which is some to the HQ of the world’s largest nation! Open 10:00 – 18:00, closed Thu. Since Oct 1 open 10:00 – 17:00, closed Thu. There are a myriad of different tickets and some buildings required additional tickets. It can be a little expensive but it’s worth it! An absolute fairytale of a building, one I had dreamt of seeing for years, often places disappoint when you see them in person, but St. Basils was even more impressive. A stunning and almost unbelievable church which looks almost as though it is made out of gingerbread and topped with multicoloured icing sugar! Finished in 1561 the onion shaped domes of St. Basils Cathedral is one of the most iconic buildings in Moscow if not the whole world. Marking the geometric centre of Moscow and sitting at one end of the legendary Red Square it doesn’t get much more impressive than this! I remember literally stopping and just staring at it when we turned the corner and finally set eyes on it! Wow! A UNESCO world heritage site the interior of the building was a total surprise for me, if you think the outside in incredible just wait until you step inside. Almost every surface is painted with ornate and details frescos dating back hundreds of years! Possibly one of the strangest experiences of our lives, but when in Moscow there is nothing quite like seeing the almost 100 year old corpse of the founder of the Soviet Union! If ever there was a stereotypically accurate impression of Russia then this is it. Set in Red Square the body of the infamous Vladimir Lenin has laid here on display since his death in 1924. The macabre display of love for their former leader is one which despite it’s controversial existence seems to be as popular as ever with both tourists and everyday Russians. You might have to queue for over an hour in the cold and go through airport style security to make sure you don’t take a camera in, but what a strange, unique and historically important experience! 10:00 a.m. – 1:00 p.m. – Thurs, Sat, Tues, Weds. The “Tangansky Protected Command Point”, now known as Bunker 42 is probably one of the lesser known but most intense and experiential things to do in Moscow. Constructed in 1951 this series of tunnels 213ft below the ground were at one time a secret military complex and command centre. Venturing down into the dark and damp bunkers is like stepping back into the prime of the soviet union, for anyone who loves that period in history this is a mecca! The tunnels stretch for an area of 7,000 square feet and connect to the metro system, there was even a direct line to the Kremlin at one point from here…which only backs up the rumours of a second secret metro running below the city. The original purpose of the bunker was to deal with the ongoing nuclear threat from the United States. Much of the museum now depicts the cold war but this time from a Russian perspective, one which many of us are not used to hearing. It was quite refreshing and fascinating to hear a different angle on things we feel we know so much about! It is also kind of scary in a thrilling way down there, especially when they set off the alarms!! 400 – 2,500 Rubles depending on which excursion you select. It is best to book online before, it can be hard to get in too so get there early! Another of the true icons of the city the Bolshoi is famous for it’s opera and world leading ballet. The iconic building which was opened in 1825 is a landmark of Moscow and Russia as a whole. An image of it is even used on the 100 Ruble banknote! What might on the surface seem like a strange inclusion on a list on top 10 things to do is actually one of the most interesting and beautiful. The Moscow Metro is so much more than just a way to navigate this sprawling city, it is a political statement, a huge piece of Soviet propaganda and a look into Stalin vision for the future of the USSR. Each station on the Metro is a unique example of the display of power and influence of the union, from grandiose architecture, sculptures, mosaics, chandeliers and detailed decorations these stations more resemble palaces than a public transport system. Opened in 1935 it is now the fourth busiest transit system in the world, it’s marble lined corridors extravagant architecture stretches to over 188 stations, the palaces of the people! Much of the city has been modernised and stripped of many of the soviet features of the union, however down on the Metro it is common to see paintings, statues and mosaics of Lenin, hammer & sickles and socialist realism style art. It is like stepping back in time to the secretive state of the USSR, living up to all your imaginations of life behind the iron curtain! Plus, riding the Metro is crazily cheap and always on time…if a little crowded! The deepest station in Europe and longest escalator! This huge and impressive museum commemorates and memorialises the Soviet Unions role in the Second World War, or the “Great Patriotic War” to the Russians. It depicts much of the unheard and unseen aspects of Second World War history missed out by Western museums and texts. With an underlying element of propaganda and western mistrust it is also a interesting look into the politics of the region. The central “Hall of Glory”, despite being built in 1995, is typically soviet in it’s grandiose presentation. The setting on Poklonnaya Hill is also significant, being one of the highest spots in Moscow it was historically an important strategic point. In 1812 it was where Napoleon stood waiting in vein for the keys to the Kremlin to be brought to him! Close by is the Triumphal arch built from 1829-34 which commemorates Russian’s victory over Napoleon. Some of the features of this world famous square have already been mentioned individually here, but this iconic stretch of cobblestones is so much more. Surrounded by a myriad of stunning and diverse buildings venturing into the square both day and night is an inspirational sight. There is a inevitable sense of awe which fills you upon finally seeing a place of such beauty and the location of so many pivitol moments of Russian history. From the red snow capped appearance of the state museum to the Neo Classical front of the 1890’s department store GUM, let alone the colourful onion domes of St. Basils or the chilling pyramid like Lenin’s mausoleum and the imposing towers of the Kremlin. This is both the geographic and cultural centre of Moscow in all it’s audacious beauty! Have you been to Moscow? Guide to Vibrant and Alternative HAMBURG, GERMANY! Amazing Tokyo views…This crazy city from different angles!